Keeping your decking clean is important as it helps to maintain the appearance of your deck, as well as keeping it free from organic matter, mold & fungus which can lead to the decay of your structure. With the right tools & products at hand, washing your deck can be simple and shouldn’t be required all too often. It’s worth the effort too; as your surface can look completely revitalised after only an hour or so of work. – How often should I clean my decking? We’re asked regularly by our readers which products we recommend for washing garden decking & we do have a few favourites that we’ve come to use regularly over the years. See our guide in Section 3 for information on how to use your deck cleaner. It has to be said that Cuprinol Decking Cleaner is the Daddy of all detergents. All our experts agreed that of the different products we’ve used over the years, this one is the best decking cleaner we’ve come across. We always use it before re-staining our decking and it seems to make it last so much longer. There will always be some elbow-grease needed with a decking clean-up but Cuprinol’s product really does minimise the scrubbing required and you can notice the immediate effect that the active ingredients are having. We’ve compared it with ordinary soap-and-water treatment and there really is no comparison. Because Cuprinol actively protects your surface after the application, it also helps to prolong the amount of time you can leave between treatment. Whether your deck surface hasn’t been cleaned for 6 months or 6 years – we’re always pretty astonished at just how well our surface actually comes up. One down-side is that at 2.5 litres you do get less for your money than other products in the market – but once you factor in the effectiveness of these products we think this definitely represents best value for money. If you have a large decking surface you might only get one or two uses from a full bottle depending on how liberally it’s applied. Our experts recommend leaving the product on your surface for the recommended time period before scrubbing with a specialised decking wire brush to bring the surface up a treat. Minimal effort for the best results. Always follow the recommended guidelines from your retailer. Wooden decking normally harbours incredibly stubborn dirt & matter which needs more intensive scrubbing with a hardwire brush and/or pressure washer. Wood-plastic composite & plastic PVC boards generally have a capped surface which requires only simple soap and water maintenance. How often should I clean my decking? Generally, our experts would recommend that you clean your deck at least twice a year, ideally in warm & dry weather conditions. This will prevent any build-up of organic matter & dirt from damaging your deck. If you would like to wash it more often, it won’t do any harm, but it’s definitely not essential. We negotiate exclusive discounts of up to 50% off with 20+ UK DIY suppliers, including Wickes & B&Q. All our latest deals, guides & tips go into our free fortnightly email. First, use a broom or electric leaf blower to remove any excess leaves & debris from the surface. You should also use a hard-bristle brush or scraper to remove any accumulations of moss or algae; leaving you with a completely clear surface to work with. Next, open up your chosen decking detergent & follow the instructions on the label for mixing with water. You should always use rubber gloves and plastic goggles with these products as they are often made from corrosive chemicals. Once you’ve mixed your treatment product with water, use a brush, sprayer or watering can to apply it to your decking. A hard-bristle brush can then be used to scrub at your surface boards. You should notice any dirt or residue matter being scrubbed away with the suds of the detergent. Leave the treatment mix on the surface to stand for 30 minutes, before rinsing the boards thoroughly with a garden hose. All suds and detergent should be washed from the boards, before leaving the deck to dry for a few days. At this stage you can then move on to re-applying a preservative, staining product or oil. For those with composite or PVC plastic boards, you may not need a brush – a simple scrub-down with detergent & water should wash any dirt from the plastic coated surface. Top Tip: If you have access to a pressure washer, you may be able to use this instead of a hard-bristle brush. These are most certainly less labour-intensive, but you should be careful with the settings. Your pressure washer should have less than 1300psi of pressure & a wide fan jet, or you risk blasting away the detail of the grain in your wood & leaving a woolly finish. It may also leave your deck very difficult to treat or finish. You should never use bleach to clean your deck as it breaks down lignin in the wood – essential for holding the wood together! It might also discolour your boards. Professional products are specially made for the treatment of timber decking boards and should always be used for this purpose. Top Tip: to remove dirt, organic matter & other debris from between your decking boards, use a laminate scoring tool or patty knife. This is the perfect width to get between the boards and clear out any debris, before using a wire brush to remove it from your deck surface. Not only will this improve the look of your deck, it will allow rainwater to run between your boards and drain away – reducing the accumulation of moisture & therefore preventing rot. Common causes of discolouration include sunlight exposure, dirt, mildew & stains. After exposure to UV rays & outdoor weather conditions, many decks will fade and experience some level of discolouration. Heavy use can also leads to stains on the surface which can be tricky to remove. 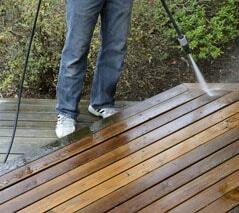 Most of the time, a simple brush-down with decking detergent will remove any offending stains. Most products will use a bleach base which will help to rid your deck of mildew and its darkening effect. If this doesn’t go far enough, you will likely need to consider either acid-washing the surface, or restoring your deck (read our full guide to deck restoration). FAQ: What should I do if my decking has turned grey? If your deck has turned grey from UV exposure, no amount of detergent will help restore its original colour. You will need to look at either acid washing the boards or sanding the surface & restoring your deck. Either option will help to help return it back to its original colour. To acid-wash your deck, simply follow the same steps as you would when cleaning it with a detergent, but use oxalic acid crystals mixed with water. Note: you should not scrub the wood, just apply with a cloth and allow the acid-wash to sit on the surface for 30 minutes before washing off with water. Plastic gloves and goggles should always be worn when working with corrosives. After use, your deck should appear much brighter & like its old self. Remember that while bleach will help to kill mildew, you should never use bleach on your garden decking. This is firstly because it can break down the wood and cause it to deteriorate, but also because mixing bleach with an ammonia-based decking cleaner can cause highly toxic fumes. Generally we recommend steering clear of bleach altogether.